Payroll-General Purpose Checks come in a double-stub format with pre-printed captions for U.S. Income Tax, Social Security Tax, Medicare Tax, and State Income Tax, plus 2 extra lines for your own deduction headings to allow payment detail for either payroll or general disbursement. 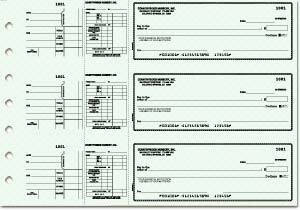 These checks are designed to fit a 7-ring binder only. The check dimensions are 7-1/4" x 3". Overall sheet size is 12-15/16" x 9". Hold down the CTRL key while clicking below for multiple captions.